In response to the May 25th General Data Protection Regulations, we at Justuno are actively working to improve our privacy functions in order to give our clients the tools they need to ensure they are compliant with international law. 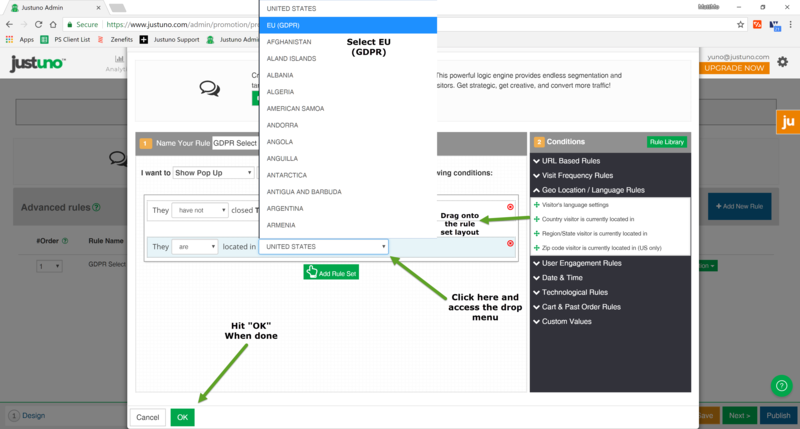 This article will focus on creating a promotion rule that is able to target visitors' origin countries via IP address geolocation, and furthermore select for or against a list containing all of the GDPR countries. If the rule is not already created in "Advanced Mode", switch to that mode now by clicking "Switch to Advancecd Mode" as shown in the image. ​in advanced rules -> conditions: geolocation -> click and drag "country visitor is currently located in" to the area just beneath an existing rule condition (in the image: "closed THIS pop up this vist"). Select from the country drop down menu "EU (GDPR)", which includes a list of all the EU countries in addition to Switzerland. Hit "OK" when done. The GDPR compliance deadline is May 25, 2018. Parties who violate regulations and who do not gain explicit consent are subject to substantial penalties. See Article 83: General conditions for imposing administrative fines.